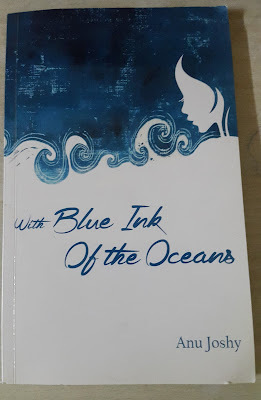 With Blue Ink of The Oceans is a poetry book by Anu Joshy. It is published by Virgin Leaf Books of Leadstart Publishing Pvt. Ltd. I have received this book from publishers. This collection of poems is a candid mirror that she holds against her soul and the society. Cover: Cover seems simple to me. I think the ocean and the girls face are trying to depict the oceanic expressions expressed in this book. The idea of keeping it simple is good but covering the bigger area with the image would make cover more interesting. Content: The book contains 55 poems from poetess' pen starting from 'Disowning Sorrows' and ending with 'Walking Into Ruins'. Poems are written in prose, conversational manner and rhyme. These poems expresses honesty of the poet in every emotion she portrayed through poems. The poems are of varied length and discovers love, society, self , friendship , etc in a totally different way. Comment: The poems are as if someone has showing you the mirror to introspect or to question various thing in society, relations and in self. The poems have depth which in some poems is difficult to understand by a common reader. The clear thoughts and command on writing is impressive. I like the way they are presented but feels there should be less poems and few poems which can stay with me even after putting down the book.' Forgotten Ancestry, Faces, Ghosts, When My Heart Speaks, When You Lie, A Fish Without A Bait, Sweet Lover, Measuring Sorrows, Haunt Me Not, Eclipse and Bittersweet' are some of the poems which I enjoyed. Pictures could have enhanced the book and make it look more eye grabbing. Verdict: Nice one time read with many enjoyable poems. Rating: I would like to give 2.5/5.